I decided to have a go and make my own Fauxdori inserts - and I'm really pleased how they've turned out. I roughly sketched out the faces using pencil, gesso'd over the pencil and then painted with acrylics. 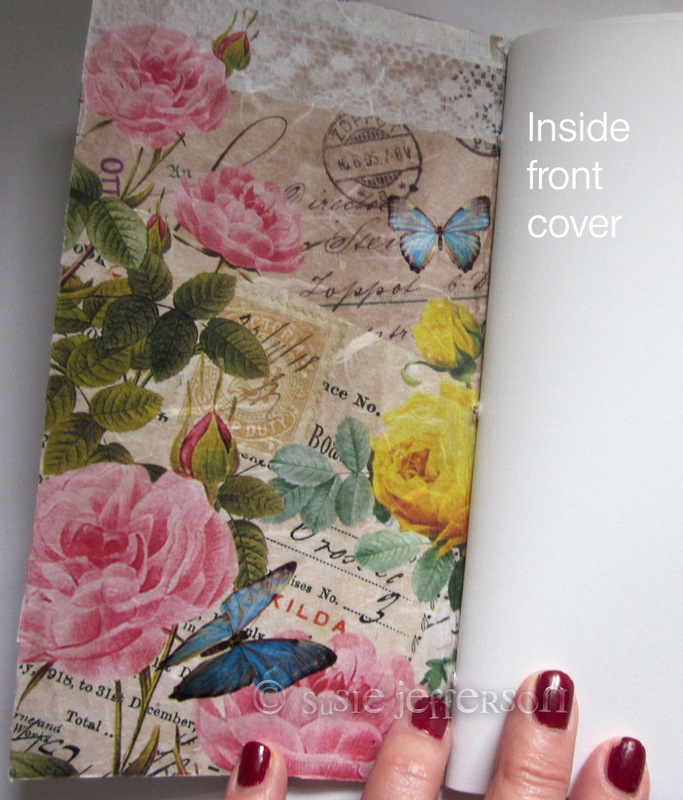 Finally, I added some collaged vintage butterflies and flowers and some rice paper from Imagination Crafts (no affil, etc). I've used a piece of thin chipboard from the back of a sketchbook (if it won't fold easily, it's too thick for this) and gesso'd both sides before adding the artwork etc. 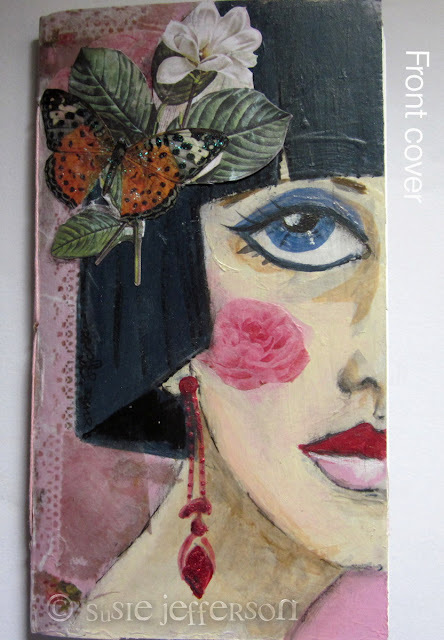 The front cover has rice paper, acrylic, my own hand drawn face, plus a bit of glitter in addition to the collage. 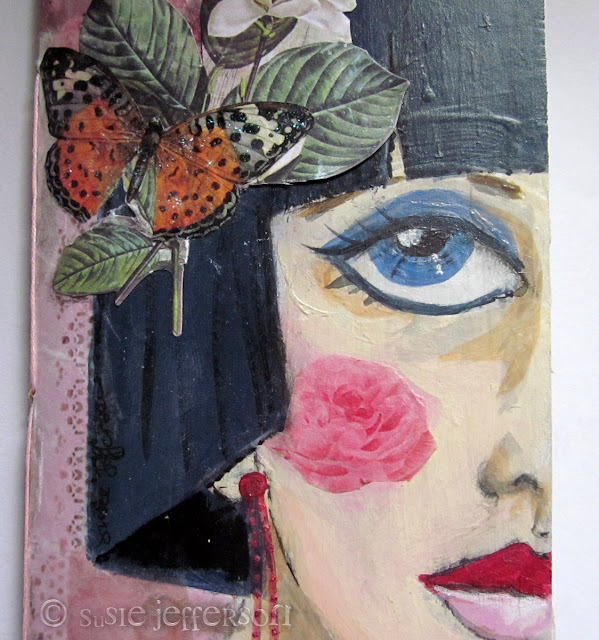 More collaged butterflies and more glitter. 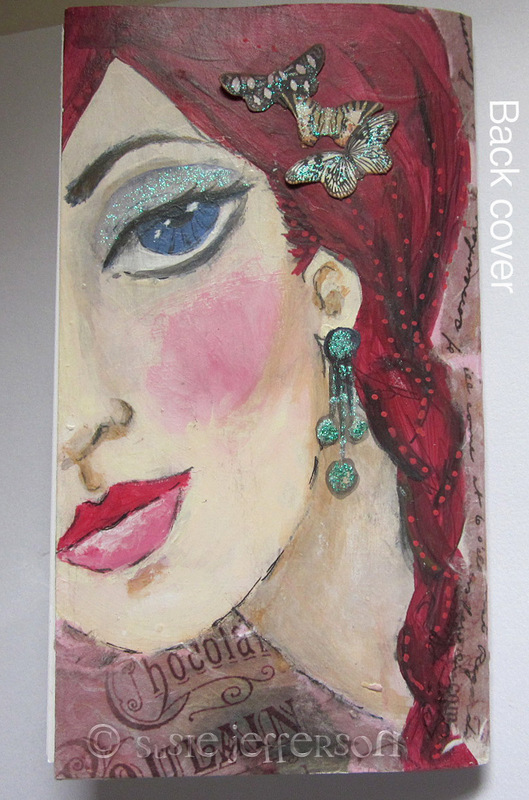 I've also emphasised the hair with dots of acrylic to follow the shape of the plaits etc. Plus glitter eyeshadow and earrings. This is rice paper glued directly onto thin chipboard. I used PVA (a wet glue) which is ideal for this kind of thing. Glue stick doesn't stick well enough, and double sided tape isn't all that brilliant either, especially if you are stitching with thread (it's a nightmare to stitch through - the needle clogs up, the thread drags etc). 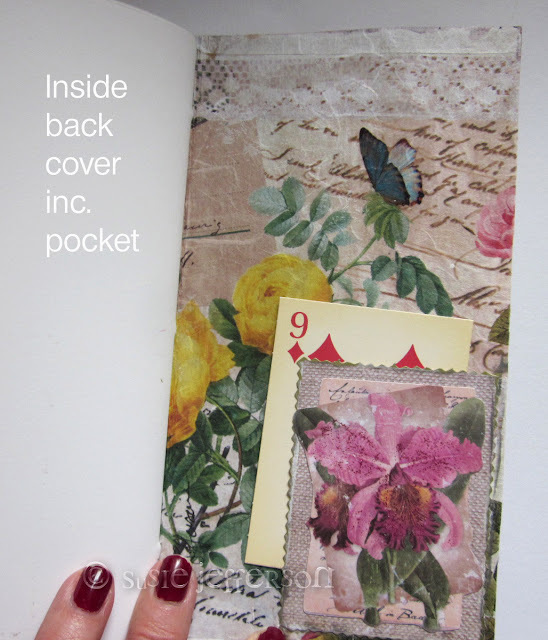 I made a little pocket from a scrapbook embellishment (glued down on one side and bottom edges). Always handy for storing ephemera etc. This is a simple 3-hole pamphlet stitch, using waxed embroidery floss. You can find tutorials online, and I have this one in my Etsy shop SOLD and a little video here. I used Fabriano Artistico papers (if you are going to all this trouble, it's worth using the best paper you can afford) which are great for mixed media and will take any amount of abuse, lol. 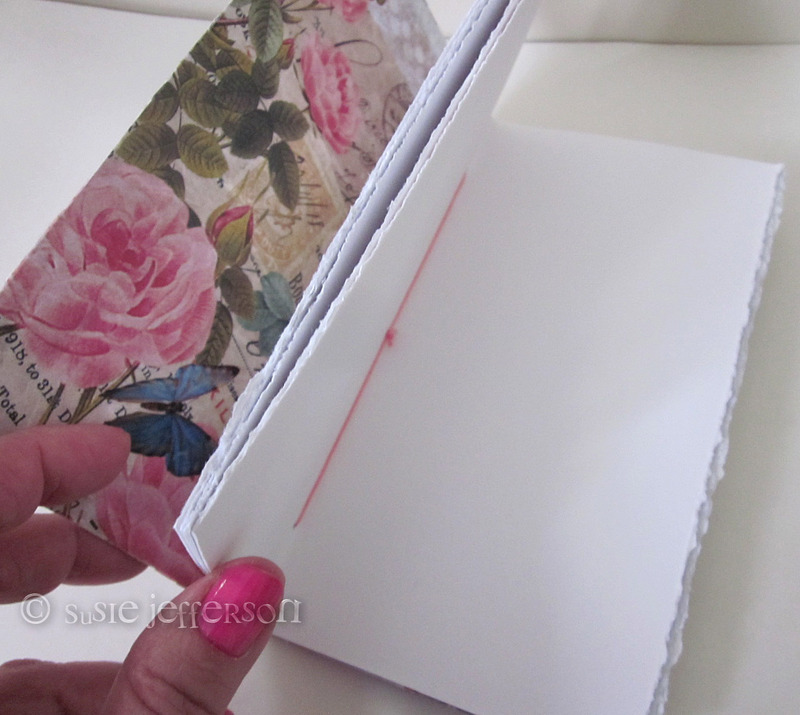 I tore the pages to size using the edge of a ruler, then distressed even more using the Tim Holtz Tonic Paper Distresser, which is a really nifty little gadget. Just run it along any edge you want to rough up - or use a pair of scissors. Just google for this - easily found anywhere including Amazon. This Fauxdori is now in my shop on Etsy. 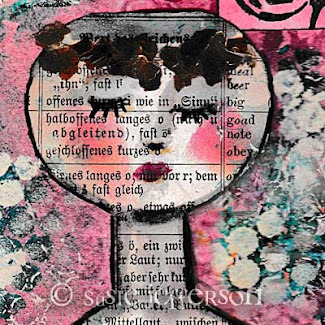 SOLD Hope you like it!